Pigeon Forge is home to America’s first skydiving simulator, and still going strong since 1983, Flyaway Indoor Skydiving. 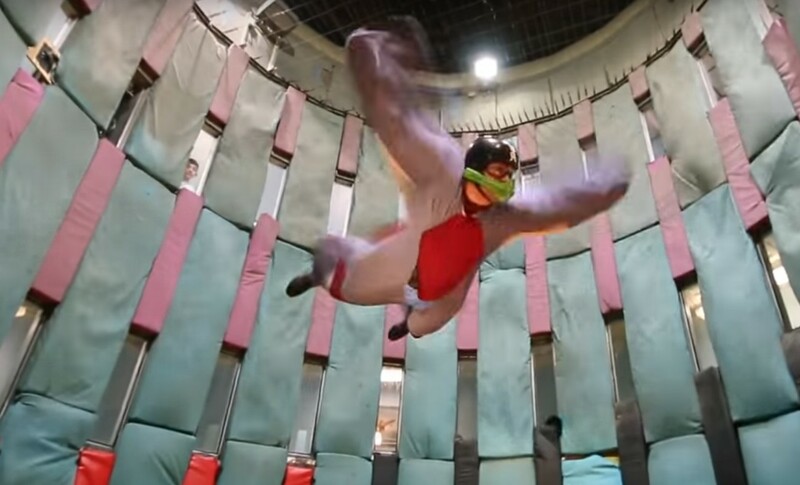 This vertical wind tunnel was developed to train in body control during skydiving – without getting thrown out of a plane first! Now anyone can experience body flight – and it’s a fun experience. Body flight at Flyaway involves you ‘floating’ in a wind tunnel that keeps you suspended above the floor. It offers all the thrills and weightless excitement of regular skydiving, but this method is very safe, with no certification needed. Flyaway runs an operation that has been awarded TripAdvisor’s Certificate of Excellence by patrons. And if you’re curious, there’s an observation deck, where you can simply stop in at Flyaway and watch the activity to see if it’s something you want to do. So what do you need to know beforehand? You’ll take a short course first. Registration for classes is first come, first serve. Each session lasts only a few minutes, so to get the most out of the experience, listen carefully to your instructor. One pro tip is to make all your movements very slowly until you get the hang of things. There’s technically no minimum age, but children must be at least 40 pounds and mature enough to follow instructions. You know your kids best and can determine if they’re ready. There is a maximum weight limit depending on height and gender; you can look this up on the chart here. Remember to wear socks and soft soled, lace-up shoes. And remember, you can check it out for free from the center’s observation deck.